It's 2018, and while there have been many technological advances in the past five to 10 years, the dreaded resume is still here to stay. While most recruiters haven't yet turned to video clips or other high-tech means to screen potential candidates, there are still some significant changes that current job seekers need to make to their resumes in order to succeed. 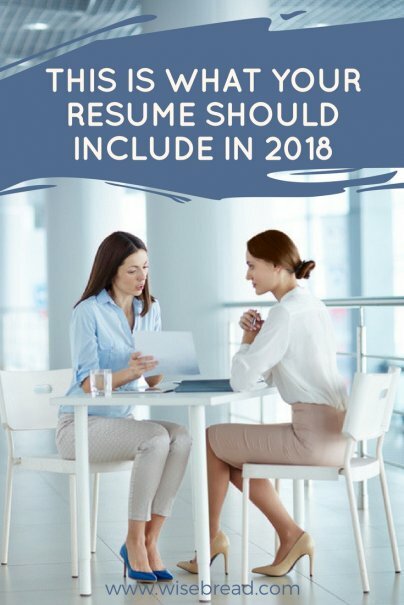 Your resume should look crisp and sleek both on your computer screen and printed out. Forget the fonts of yesteryear, like Times New Roman. Forget the graphics and fancy bullet points, too. You want your resume to resemble a modern, minimalist style. If you plan on submitting your resume through an online application platform, a simple style will read better than a complicated template. According to Live Career, recruiters spend an average six seconds reviewing an applicant's resume. That's it: You have six seconds to convince a busy recruiter that you are worth a closer look. Don't start with a stale "Objective." Instead, jump into your resume with a compact and powerful sentence or two about your experience, and follow with your most relevant achievements and skills. Good news! You can toss out your address, cover letter, and references along with your objective. Instead of a physical address, include your LinkedIn profile url. As for references, if a recruiter wants you to send them, they will ask for them — so don't waste space on your one-pager to mention that they are available upon request. Think your well-crafted resume is going to be read by a thoughtful human? Think again. Many companies rely on automated screening bots to help weed out poor applicant choices. The point of this technology is to save recruiters and human resource employees time, but sometimes the process can trash worthwhile applications before human eyes even have a chance to see it. Acme is the USA's largest stick dynamite maker, a family-owned, $10M business. I was brought on board to start a Materials Management function as the company grew outside the Southwest to serve the entire country. She stresses that this method would show a hiring manager who she worked for (and the significance), the job she was hired to do, and what she accomplished.